As we have established, I do not belong in competitive play. It’s just not my jam. Fun to number crunch and think about, yes. 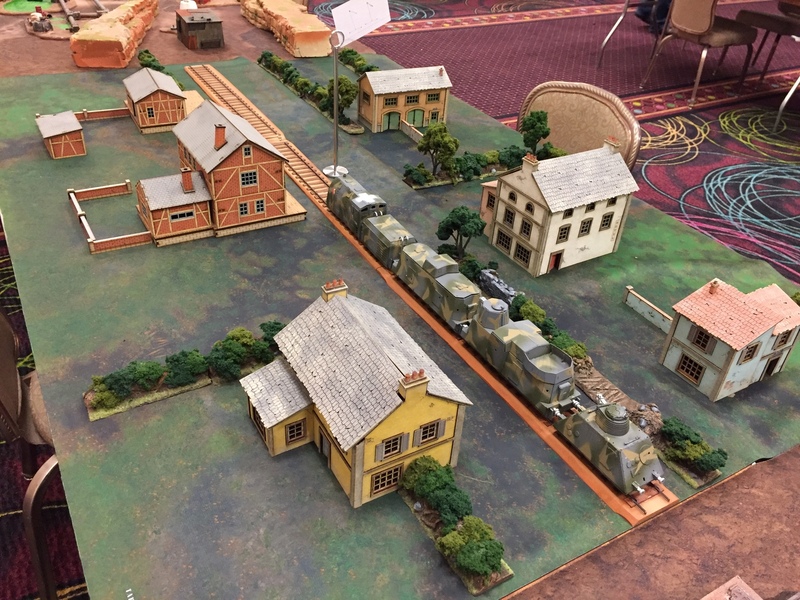 Which is why, for the past three years, I’ve played “friendly” events at the Las Vegas Open – and why I’ve been pleased to see the options proliferate for more casual gamers who still want to go to a marquee event. This year, like the last, I went to the Team Narrative. So how’d it go? The Narrative Guys were back this year, and I’d call the event both a success, and an improvement over last year’s event (review here). 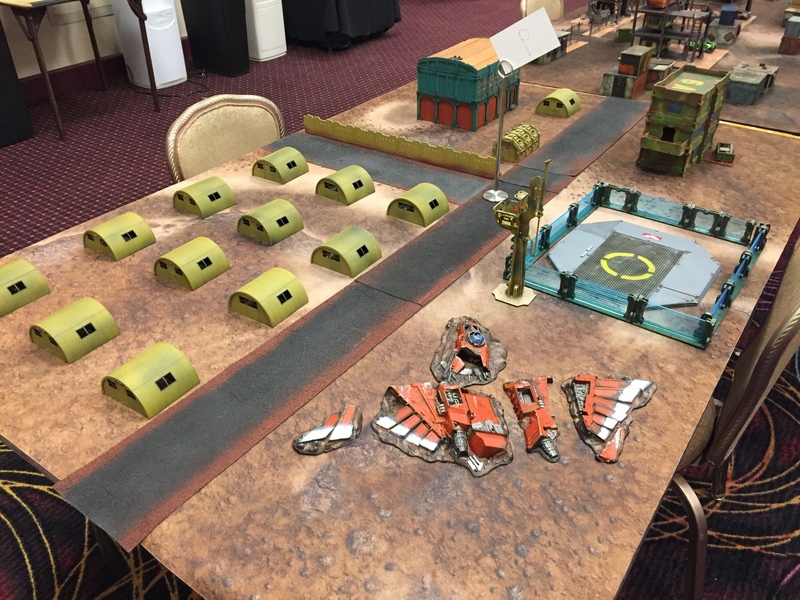 First, they trimmed the event down to two days, largely by swapping the “Kill Team and Cocktails” event on the first day of the LVO with free, open, casual gaming on the last day of the event. 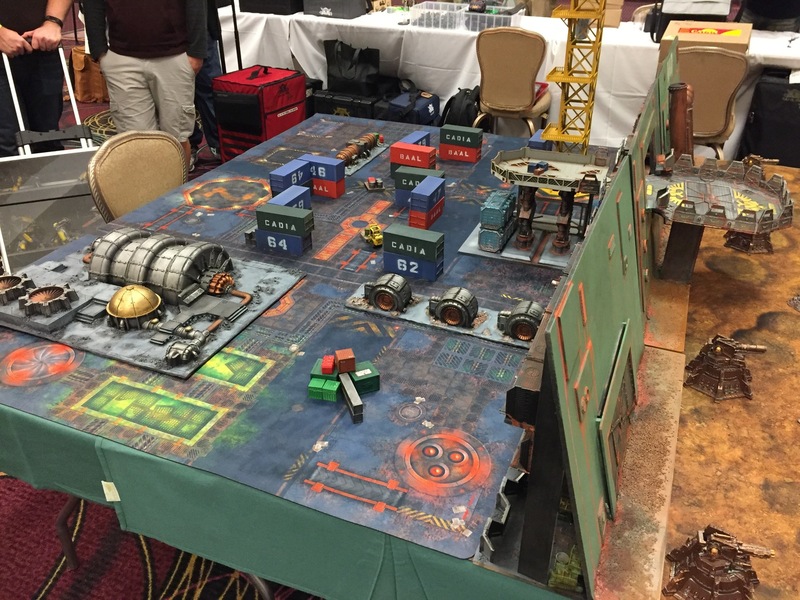 I think overall this was a solid idea – while Kill Team is fun, and I got to play on an awesome Zone Mortalis board last year, it didn’t really add much to the event. Last year, I referred to the Team Narrative as “Surprise Apocalypse”. Basically, last year most people seemed to be assuming that things would run like they do for lots of Horus Heresy games, where your “team” is actually a bunch of single armies trying to accumulate a pool of wins. Which then came as a rude surprise when they were instead tossed into a 6000-8000 point per side Apocalypse game. To their credit, this year, that was an option – there was a whole Solo Narrative circuit. But I actually liked the larger games. 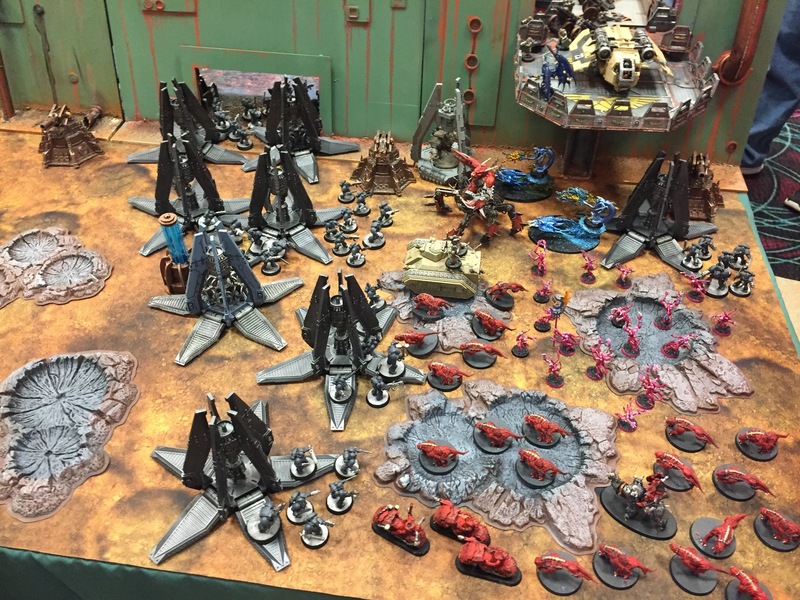 Though they did get pretty crowded – I didn’t bother deploying about half my Eldar last year. How did they solve that this year? First, the cat was definitely out of the bag, so our team at least was actively coordinating what people were bringing. They also dialed down the number of points – 1500 pts. per side and three players, which meant 4500 points for each side and 9000 points overall, a pretty sharp drop from 12-16,000 played on 6×8 tables. One of the things I liked last year about “Surprise Apocalypse” is that since nobody came loaded for an Apocalypse game, it wasn’t utterly dominated by superheavies. 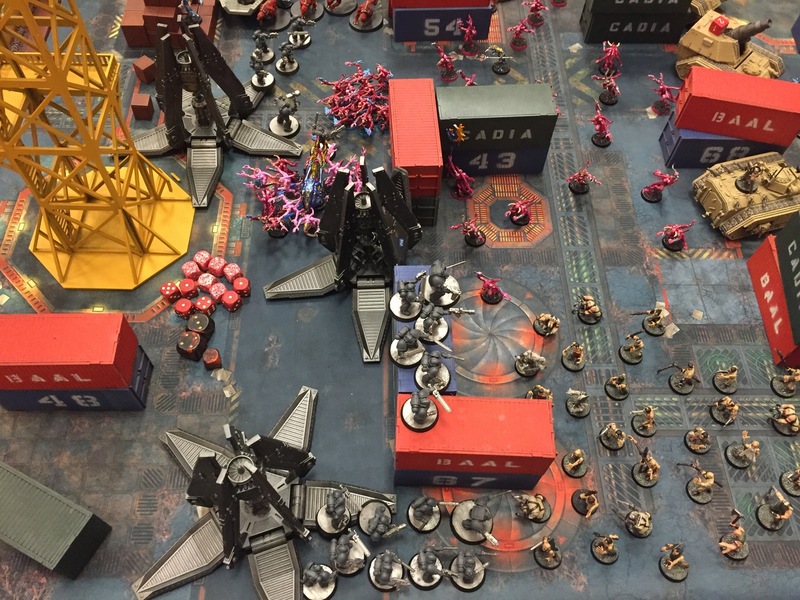 This year, I was a little worried that everyone would know what was coming and plan accordingly – thankfully, the points limit and a ban on Lords of War meant it was still a troops-heavy epic battle. In my case, I took a Blackmane’s Great Company detachment – as I mentioned in my Curse of the Wulfen review, these detachments are pretty tax heavy, so it was pretty barebones. 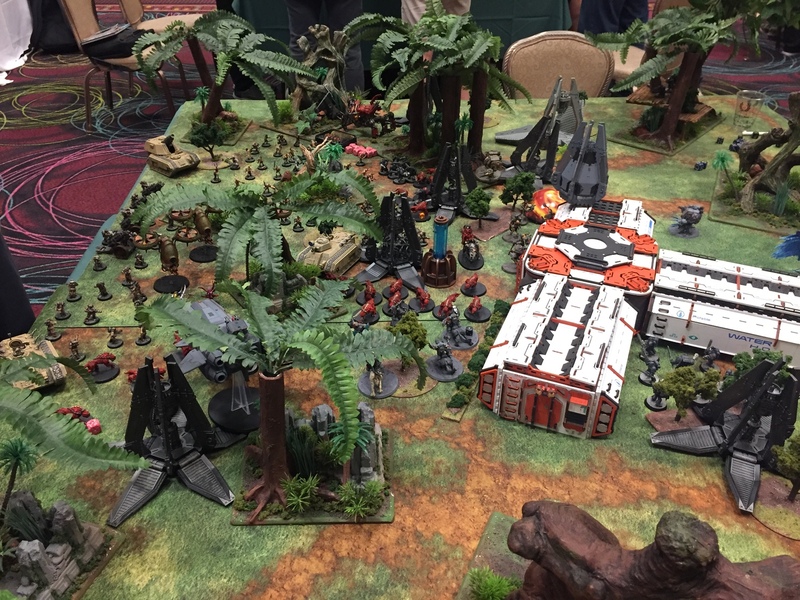 My partners played the opposite – ultra-elite Thunderwolf and Wulfen based forces. We were faced off against three very nice guys playing a KDK list, a Tzeentch-heavy list that was fairly offensive casting based but hadn’t broken out the worst of the stuff from the new Wrath of Magnus supplement, and a Renegades list with some zombies, artillery, and Outflanking Chimeras. We were all also allowed to field a 2nd list – they had some minor spins on theirs, we all fielded the same thing. The first day began with a pretty casual explanation of the mechanics of the next to day, both their sportsmanship rules and how the narrative would actually go. The Narrative Guys developed a more sophisticated system this year for determining games and scenarios, which was nice – it made the games feel more connected to each other. And I’ll give them credit, for a Space Wolves vs. Chaos matchup, they didn’t take the obvious bait around Fenris going to pieces for the narrative scenario. One of the big problems last year was there were some very all-or-nothing, “Operation: Table Your Opponent” style missions. This year? Each side would have a different objective, going after different things, and potentially both either attacking or defending. It made for a much more dynamic game, trying to balance your objectives with defeating your opponents – and introduced a bit of psyops in keeping yours a secret and guessing theirs. 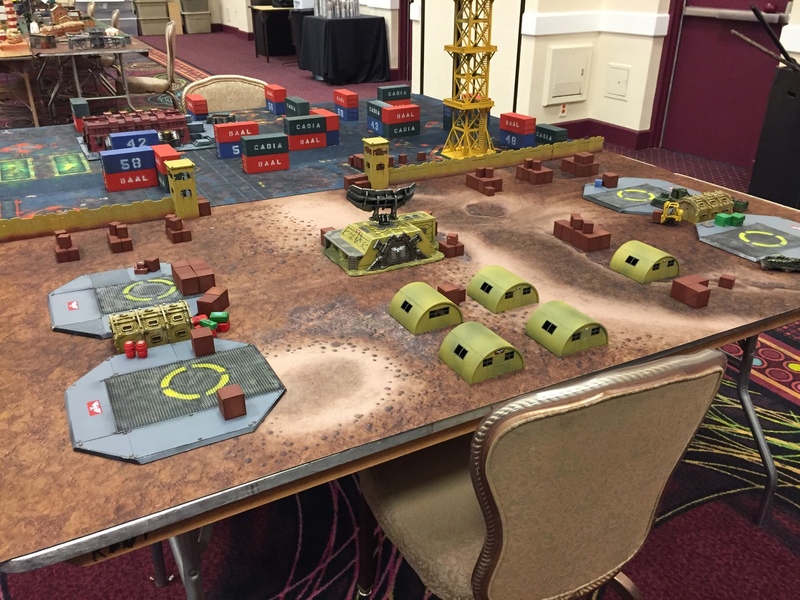 For our first game, we deployed on a Dockyard themed table, the Space Wolf objective being to secure a landing zone by having more wounds/hull points on one of four landing pads secretly designated (and later indicated for our opponents by an Arvus Lighter landing and taking off). Their objective…involved something about cultists and swirly portals. My strategy was incredibly subtle. Drop as many pods in their face as possible and play for time, keeping them as far away from our landing pad as possible. The network of shipping containers made for lots of excellent choke points. Heroic Grey Hunters and Blood Claws would die slowly, some artillery and a Sicaran provided a base of fire. Then the followup punch with Wulfen, Thunderwolf Cav., Murderfang and Bjorn would pick off what was left. That is…about how things went. Things got off to a slow start, what with my turn one being an utterly exhausting amount of movement. The “highlight” of the game was the Tzeentch players tricked out HQ Demon Prince (I think) taking a wound from Perils of the Warp, failing their 3++ save from The Impossible Robe, promptly failing their Ld test…and blinking out. That put a bit of a damper on the whole thing for them, understandably, though they took their improbably bad luck with good humor. The game ended in a draw, with the landing pad secured from a Deep Strike/Outflanking counter-attack from some Blood Letters and a Renegade squad in a Chimera, but with us unable to penetrate deep enough into the Chaos lines to disrupt the various portals. The second day had higher expectations – hammering out two full games, which meant speeding up. It was rushed at times, but I confess that’s as much my fault as anything, what with playing “The Grey Tide”. Game Two had a tougher objective for us – having a character in base to base contact with a portal in the enemy deployment zone, not in close combat. 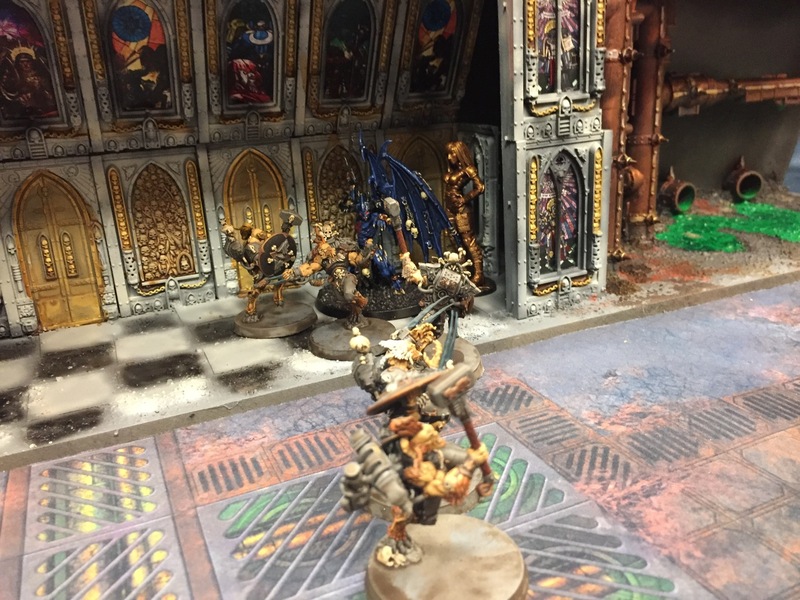 They had to get some psykers into contact with something in their deployment zone and sacrifice them – something we discovered when they succeeded and all three players let out a scream in full stereo. Woops. The final game of the event was, for our team, played on what’s arguably their marquee table, the wall of a hive world. Not the friendliest table for a drop list however – there’s no dropping into the inner part of the city, what with thousands of floors of hive city above it. Our objective was to keep a religious shrine clear of enemy models, while their objective appeared to be herding civilians into a waiting aircraft for…nefarious Chaos-y things. We decided for some unconventional strategy here – the Chaos team was only told that something was disrupting the warp, and the Shrine was…fairly subtle, while there were other bits of terrain that looked like they could also be warp disruptors – large scale generators, some pylon looking things in the wastes, etc. So we decided to try some deception, and defend the other objectives. This meant dropping my entire army outside the walls, creating what I ended up nicknaming “Drop Pod Forest”. This worked really well. As one of the event organizers put it, we had just fed their confirmation bias, and as their second turn was winding down, it was clear that they didn’t have any idea what our objective was, and that all we had to do was stay silent. But that is not the way of the event. So we gave them a hint in order to turn it into an actual game. And what a game it was. Two Demon Princes were killed in a single turn (one of them by Wolf Scouts and Drop Pods, all I had left on the board), then brought back with Warp Tether, threatening the shrine. They were killed in a massive charge of Wulfen and Wolf Guard along with two Stormfang gunships, and we were pretty sure we had the game. And then…Tzeentch had his moment. A lucky result on the Warp Storm table put a unit of Brimstone horrors close to the objective – they needed a 6 on their run move to prevent us from winning. And sometimes, the Changer of Ways delivers. Hilariously, the fluff for our campaign was already written up by this time, so the organizers had to go back and rework it. It was an epic end to an epic series of games, and I don’t feel even a little bit bad for losing by a hair’s breadth. Last year, my primary complaints about the event were that the missions were very Zero/Sum and the size of the games made things very much a mass parking lot. Both of those were resolved – indeed, if anything the mission design seems to have swung around to slightly favoring tied games. The reduced point counts helped immensely with games going faster and being able to use one’s entire army, while still retaining the feel of a large scale infantry-heavy Apocalypse game. The Narrative events last year was some of the best gaming I did all year, and this year was definitely an improvement on the core of the event – broadening the ways to participate in the narrative, a tighter linking between the games and the narratives, and improved missions that were more dynamic and less winner-takes-all. 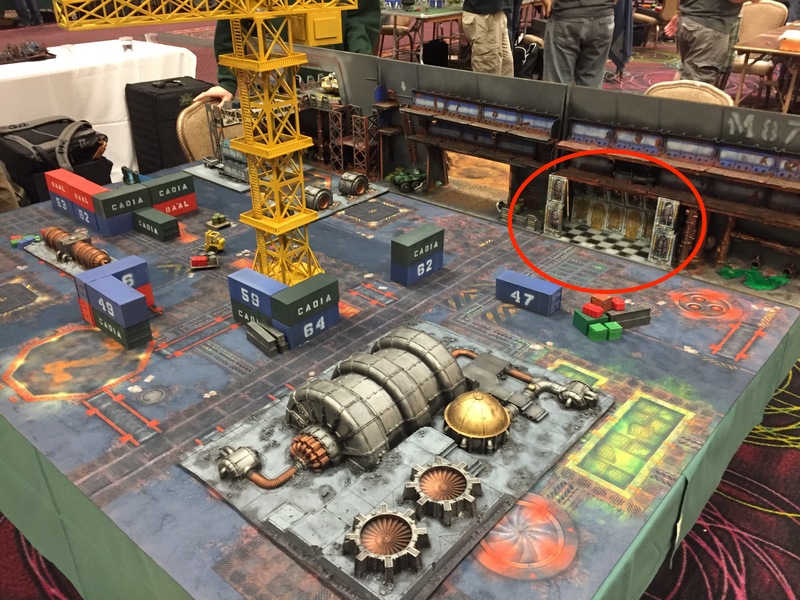 To my mind, playing narrative missions on beautiful tables is pretty much the heart and soul of 40K, and it’s nice to see it have a place at the Las Vegas Open. If you have the opportunity, I’d highly recommend it. Rating: 9/10 – Amazing tables, good people, and an awesome time. Get your narrative on. Odds of stumbling on two different blogs written by the same person on different subjects is low but. Both well written focusing on research driven analysis as opposed to what ever opoinion and flame war normally dives a blog. Both of you in the medical field. Similar enough styles. I like both blogs. Nope! I do have something new to read now though. Previous Post: Is Going to Tournaments Correlated with Winning Them?